Organic Skincare in NZ – Why Natural is Best? The health of your skin is crucially important to your physical, emotional, and mental wellbeing. The products you put on your skin are, therefore, important too. The problem is, mainstream products contain man-made substances including chemicals, preservatives, and artificial fragrances. We simply don’t know what impact these substances have on our skin in the long-term, or to our health overall. For us at Honest Skincare, that’s far too great a risk to take. Every single ingredient we use is a natural, edible product and organic & vegan wherever possible. We don’t want to put non-natural substances on our skin, so we’ve created a range of natural and organic skincare products which are available throughout NZ. Every single ingredient we use in our products is natural and edible. They are also organic & vegan wherever possible, with the exception of beeswax. This is because we believe if you wouldn't (or couldn’t) eat an ingredient in a skin care product, that product shouldn’t be anywhere near your skin. So, we don't add chemicals, preservatives, fragrances, or anything else to any of the products in our range. Instead, we use pure oils, butters, tea (organic and Fair Trade), coffee, and spices, blending them by hand to create our unique range of highly-effective skincare products. In addition, all our products come packaged in BPA-free tins to ensure nothing contaminates the product inside. 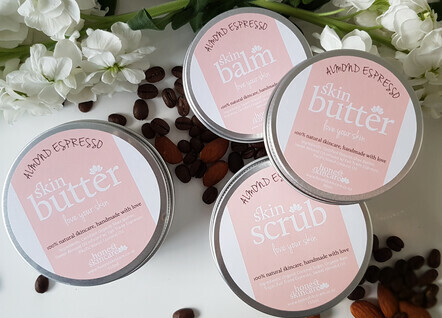 We create a skin butter, cocnut-sugar scrub, and balm in a range of naturally infused flavours. Moisturise your body from head to toe with our soft and silky skin butter. Exfoliate and brighten your skin with our sugar scrubs. Treat dry skin spots and keep lips supple and smooth with a soothing balm. At Honest Skincare, we also believe natural and organic skincare products should be affordable. We want you to use our products every day, happy in the knowledge that everything you are putting onto your skin is made with 100 percent natural ingredients. We deliver throughout New Zealand, so browse the range today. Like us on facebook and follow us on Insta for free samples, hints, tips, voucher codes and product info. Tag us on insta or facebook to go in the draw to win a product of your choice!